• A boomless, roller-furling sail rig similar to the rig on the Hobie Bravo with plenty of sail area for excellent performance, completely manageable from the cockpit with the pull of a line. • Two retractable amas that fold up against the side of the boat, again with the simple pull of a line, for easy docking, maneuverability, and transport. • The cockpit is the stable platform of the Hobie Mirage Adventure Kayak, offering full versatility as a pedaling kayak when conditions are not convenient for sailing. All 2007 model year Adventure Kayaks, including the Fish model, will have inserts molded into the hulls so that they may be upgraded to an Adventure Island with a kit available through the Parts Department. The ama colors will be limited, and the Adventure Island will cost more when purchased via an upgrade kit rather than purchased initially as a complete boat package. • The Hobie Mirage Drive allows the boat to be pedaled while under sail, or simply pedaled with the sail furled for versatility not found in any other sailboat. 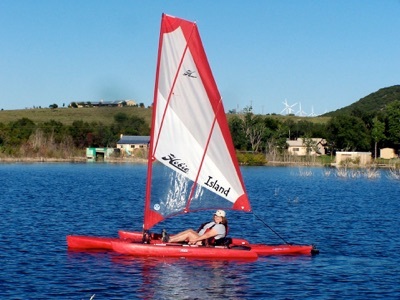 The Adventure Island is loaded with additional standard features such as a daggerboard; oversized "Twist and Stow" rudder; Mast and Sail Cover; and an Ama/Daggerboard Bag. • The Adventure Island will be offered in two color packages: Golden Papaya and Red Hibiscus. Both options include beautifully color-coordinated sails.